I have a quilt that I sleep with. Every night. Anyone with whom I have travelled knows about this quilt. If I travel, it does too. Recently, I was going to sleep and couldn't find it. Lowell tossed me a quilt, but it wasn't the quilt. Even though it was dark, I knew. He had to get up and go find it on the couch; otherwise, I wasn't going to be able to sleep. I used to tap my wedding ring on the steering wheel as I drove, and any time it wasn't on, I got nervous. I don't like to leave home without my cell phone. It makes me a tad anxious. These are little quirks of mine, and I know that we all have them - certain things we have to have in order to make it through the day. Whether it is coffee in the morning, reading the newspaper in a particular order, exercising, Diet Coke, or a tangible item to carry with us, many of us have something routine that makes us feel more at ease about our day. For one of the guys next door, it's chicken. Yes, chicken. But not just any chicken. 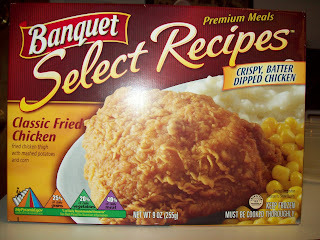 It has to be a Banquet Select Recipe Classic Fried Chicken. Every day, he goes to work from noon to four. He takes his lunch. Every day, it's the same. It has to be chicken. And it has to be this particular chicken. It's $1.57 at Wal-Mart. Banquet makes a meal just like this one, but it's not "Select Recipe" and it's only a dollar. And it just will NOT do. It has to be this one. We about had a panic attack of our own about two weeks ago when Banquet went and changed the packaging. But there was no need to fear. It wasn't an issue at all. So this is his comfort item. Our daily routine is pretty much the same every day. We hang out and take our time getting ready. Watch a little TVLand, complain about taking a shower and changing clothes, talk about what time we go to work, then he actually gets ready for the day. It's usually around 10:30 when we pack the chicken, head out to get a pop, go for a ride around town, run any necessary errands, and drop him off at noon. Today, we got going early, so in all my wisdom, I decided to leave the chicken in the freezer and we would come back for it later. He was okay at first, with constant reassurance that we would get the chicken before work. But then he started asking, at least every 20-30 seconds, "gonna get my chicken?" His panic was leading me into a panic and I knew it wouldn't be long before we both needed some Xanex. So we headed on home to get the chicken. Now, as if all this wasn't already a little on the crazy side, it's important to know that he doesn't ever eat the chicken. Nope, it comes right back home in the same bag it was packed away in and we throw it in the trash to clear out the bag for tomorrow's chicken. I guess I shouldn't say that he never eats the chicken. He eats it often enough that there is no way to fool him. You can't stuff a piece of foam in the box and reseal it. You can't give him yesterday's chicken, because God forbid he eat a frozen dinner that's been thaw for days. So, once every couple of weeks, he'll get in the van after work and immediately say, "I ate my chicken." There's no pattern or routine to this. As odd as it seems, if the chicken keeps him happy, then we'll keep the chicken coming. And never again will I be so ignorant as to leave home without it.